SNOW GOOD: Christie Walter and Chantelle Fava get a taste of Little Creature's upcoming Winter Wonderland carnival. 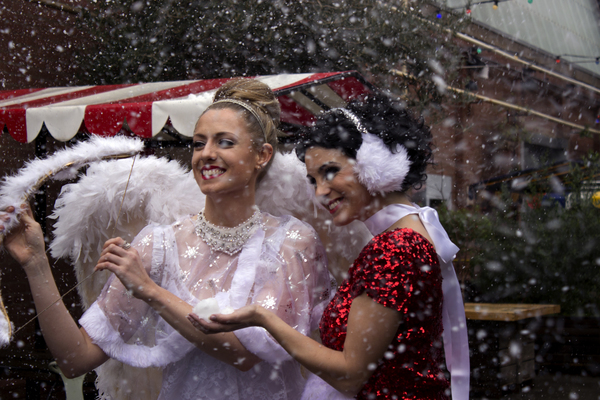 Snow, ice sculptors and magicians will transform Geelong’s Little Creatures Brewery into a Winter Wonderland this month. The carnival would be back “bigger than ever” with snow machines galore and winter brews, Little Creatures hospitality manager Paul Rogasch said. “We’re really excited that Winter Wonderland has grown into an annual highlight for the Geelong brewery,” Rogasch said. Winter Wonderland returns on 21 and 22 July with live ice sculptors creating everything from cherubs and kombis to polar bears. The carnival will also feature a Frozen-themed jumping castle, snow bunny hoopers, snowflake skaters, magicians, fire performers and live music to beat the winter blues. Little Creatures would showcase its specialty winter beers at the event, Rogasch said. Locals can get a taste of The Fuggle is Real stout, and the brewery’s most recent single batch, its hop-packed winter IPA, as well as a specially-created spiced, “tastes-like-Christmas” cider. On top of the brewery’s new winter food menu, the carnival will include winter-warming treats from beef chilli con carne, to poutine loaded fries and chocolate fondu. “If you’re looking for an event to knock your snow-covered socks off, hot-foot it to the Little Creatures Brewery Village,” Rogasch said.